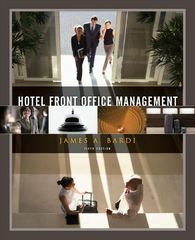 Hotel Front Office Management 5 Edition Hotel Front Office Management uses a human resources approach to cover the unique management and operational challenges in the front offices of today's hotels and lodging facilities. This Fifth Edition continues its emphasis on applying theory and management strategies, as well as providing updated material on select-service hotel front office operation. It addresses the impact of the recession on the hotel business and discusses the impact of social media and guestroom technology on the hotel business and how the Internet is the single most important travel planning and distribution channel in hospitality. There is also new and updated information on environmental and sustainability issues, particularly as it relates to housekeeping topics.